If West Homestead was the borough that inspired us to begin the quest, Crafton was surely the precursor to our caution-to-the-wind excursions around the county in search of landmarks. The original goal? The Kings Family Restaurant in Crafton. As the story goes, one day Mr. O'Donnell and myself set out to go to Kings. Should we try the one in Aspinwall? Nah, we had just been there. Let's go to Crafton. Two hours later and one stop at Sunoco, we arrive at the Crafton Kings, in Robinson Township. We had, however, traversed the entire landscape of Crafton. If the Crafton Kings had been located in, say, Crafton, surely we would have found it. 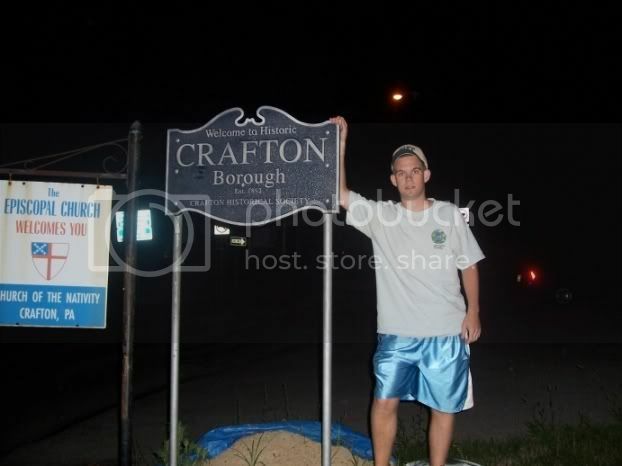 The whole ordeal prompted Brendan to make the outlandish statement, "We are never going to Crafton again." Two visits later, we are finally taking pictures of the sign.